Like most of us, Graham has since childhood been in love with the American western movie and is a special fan of both Roy Rogers and John Wayne. As a youngster, growing up in England, he found he could share a special kinship with his cowboy heroes by drawing and later painting them. Admitting to being strongly influenced by American western artist Charles Russell, this self-taught painter has spent the last 26 years developing his own special style, somewhat reminiscent of Norman Rockwell. Graham’s very close attention to detail and his knowledge of the American West and the Hollywood Western movie help him produce amazingly accurate historical studies or whimsical looks at a west gone by. 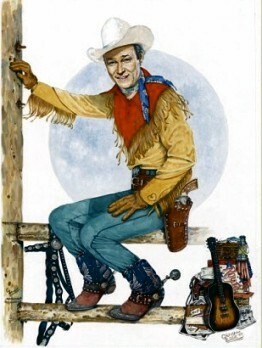 His talent really shines when it comes to creating wonderfully life-like portraits of either historical western figures or western film heroes. A specialty of his is creating one-of-a-kind, hand-painted western portraits working from color photographs supplied by SASS customers. Each one is surely a family heirloom in the making.